Submitted photo New Jasper United Methodist Church recently held Blessing of the Animals/Pets. Owners, along with their pets, photos and memories of loved pets that had passed on, enjoyed a lovely evening around the fire pit located in the church back yard. Pictured is Layla, a pot-bellied pig which was a rescued pet, is shown getting blessed by Pastor Alice Kay Lovelace. Layla lives in the country along with two other pot-bellied pigs, dogs, miniature donkeys, cats, horses, cattle and rabbits. Pastor Alice also blessed cats and dogs that attended. New Jasper United Methodist Church recently held Blessing of the Animals/Pets. Owners, along with their pets, photos and memories of loved pets that had passed on, enjoyed a lovely evening around the fire pit located in the church back yard. Pictured is Layla, a pot-bellied pig which was a rescued pet, is shown getting blessed by Pastor Alice Kay Lovelace. Layla lives in the country along with two other pot-bellied pigs, dogs, miniature donkeys, cats, horses, cattle and rabbits. Pastor Alice also blessed cats and dogs that attended. https://www.xeniagazette.com/wp-content/uploads/sites/32/2018/10/web1_blessing.jpgSubmitted photo New Jasper United Methodist Church recently held Blessing of the Animals/Pets. Owners, along with their pets, photos and memories of loved pets that had passed on, enjoyed a lovely evening around the fire pit located in the church back yard. 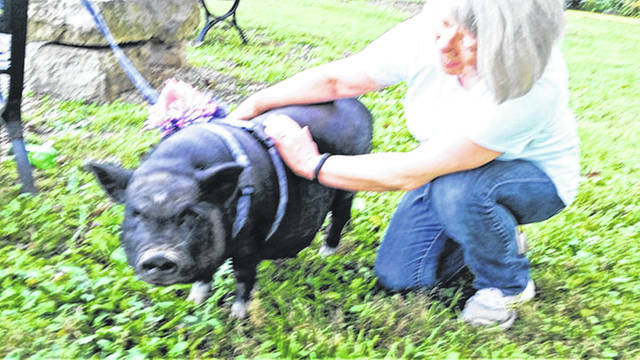 Pictured is Layla, a pot-bellied pig which was a rescued pet, is shown getting blessed by Pastor Alice Kay Lovelace. Layla lives in the country along with two other pot-bellied pigs, dogs, miniature donkeys, cats, horses, cattle and rabbits. Pastor Alice also blessed cats and dogs that attended.